Great Britain’s Alistair Brownlee returned to the top of the World Triathlon London podium for the first time since scoring Olympic gold in Hyde Park in 2012. Spain’s Fernando Alarza made his way on the World Triathlon Series podium for the first, while France’s Vincent Luis took bronze in the men’s race. In the women’s race, the US swept the podium for the second time this season with top performer Gwen Jorgensen taking home her 10th consecutive title ahead of compatriots Katie Zaferes and Sarah True. 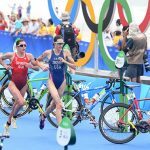 The Star – Spangled Banner was represented by more than one on the podium on Sunday as the USA women swept yet another podium in the 2015 ITU World Triathlon London. 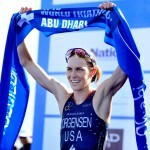 Gwen Jorgensen continued her undefeated record as she took home the gold medal to claim her 10th-straight WTS title. She was joined by fellow compatriots Katie Zaferes and Sarah True (nee Groff) who earned the silver and bronze. 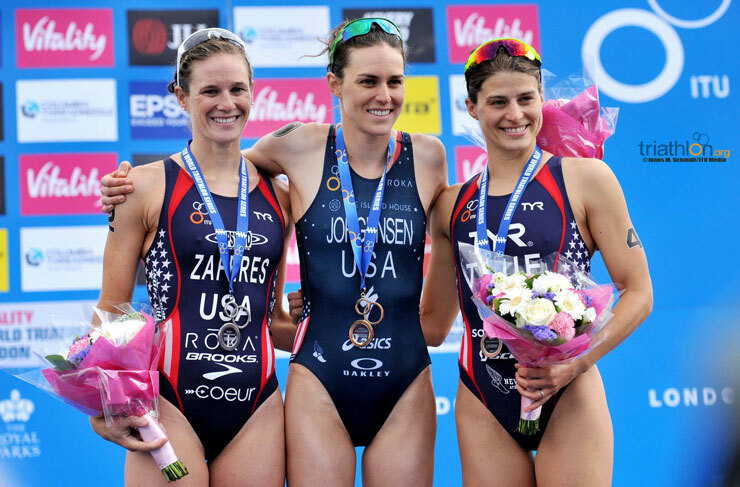 The USA sweep marked the second time this season that these three women have dominated the WTS podium—first time being the Gold Coast in Aprit – making USA Triathlon the first National Federation to sweep the podium twice in one season. Proving that she can tackle all three disciplines with ease, Jorgensen showcased a consistent performance in the swim and bike that positioned her among the leaders. Heading into the run, her signature breakaway move was executed halfway through the first lap that carried her well into the finish line to tally yet another first-place honour. London allowed for some chilly-weather conditions that added wetsuits to the uniform. 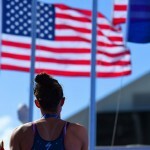 Despite nearly missing the final buoy on the one-lap swim, Carolina Routier (ESP) was the first athlete out of the water followed closely by all of the top US women including Zaferes, True and Jorgensen. The group, along with Margit Vanek (HUN), Sophie Coldwell (GBR) and veteran Ainhoa Murua(ESP), managed to break away early on the first lap of the bike to earn a half minute gap over the chase that included nearly 30 women. Although the chase contained talented cyclists like Andrea Hewitt (NZL) and Barbara Riveros (CHI), the large train of women couldn’t manage to chip away at the 30-second deficit. While Great Britain’s Vicky Hollandhammered away in the chase, teammate Non Stanford, who won the World Championship title on this course two years ago, slipped into the second chase and couldn’t recover in time for a repeat podium performance. Immediately after the second transition, the three US women capitalized on the short two-lap sprint to gain a steady lead that remained until the end. While Jorgensen pushed ahead to secure the gold, Zaferes and True ran side-by-side in a battle for who would take the next medal. Ultimately it was Zaferes who was able to push a tiny bit more energy in the end to take the second-podium position. Closing a once substantial gap, Holland and Aileen Reed (IRL) threw out a phenomenal run and were able to finish at fourth and fifth respectably. Making his home country proud, Alistair Brownlee (GBR) captured a breakaway win at the 2015 ITU World Triathlon London on Sunday. With the familiar crowd cheering him on in Hyde Park as he crossed the finish line at 50:39, the Brit was able to tally his second WTS victory of the season. Taking the silver medal was Spain’s Fernando Alarza, who claimed his first WTS podium of the year. He was followed by Vincent Luis of France with the bronze. Luis’ performance earned him his third podium position of the season after a second-place finish in Abu Dhabi and third-place finish in Cape Town earlier in the year. Lining up for the sprint race, the typical London weather left the men with particularly cold-temperature conditions to get through the short one-lap swim, four-lap bike and two-lap run course. Wetsuits in tow, Henri Schoeman (RSA) and Richard Varga (SVK) led the 750-kilometre swim and into the first transition. 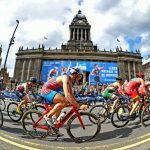 Despite coming out of the water with a respectable position, home turf advantage could not swing in favour of Jonathan Brownlee (GBR) as a mechanical problem on the bike forced him to lose his momentum and leaderboard position. The bike malfunction saw the younger Brownlee fall more than a minute behind on the first of four laps. Meanwhile older brother Alistair led the lead pack around Hyde Park alongside the likes of Aaron Royle (AUS) and Vincent Luis (FRA) in an 18-man pack. Expert sprinters Mario Mola (ESP) and Richard Murray (RSA) also missed the first group and were forced to start from a deficit on the two-lap run. Luis and Brownlee continued their quest for a podium as they took the top spot early on the 2-lap run. But Alistair left nothing to chance and blasted away on the first lap to create an insurmountable gap. A gap that would lead him right into the finish line and right into the position of hearing Great Britain’s national anthem alongside his national people. With two medals still up for grabs, the last lap of the run saw a battle between Alarza, Luis and Ryan Baile(AUS) all pushing til the end. But ultimately it was Alarza and Luis who were able to exert a last-minute effort to take home the silver and bronze. Despite his absence, Javier Gomez Noya (ESP) maintained his Columbia Threadneedle leader position in the rankings after winning his first WTS race of the year in Yokohama, Japan on May 16.